Pansy loved it! She was very impressed, and loved the look and feel of it. She said she would phone you, so I hope she choses a time when you can answer the phone. I have found some pink yarn which I made with mittens in mind – but perhaps it will end up as a hat. Maybe next month you will find out about that! Thanks Judith. Just picked them up from the office. They look great! The priest was very happy. He loved what you did. Thank you. Judith -- Dad says you've done your usual wonderful work. "Worth every penny." just a quick word to let you know that I was able to pick up the bound copies of my thesis - they look stunning. I had a wonderful time meeting you and being in your studio this morning. Your love for books, their ideas, and the stories and people behind them is certainly infectious. I walked away knowing why I had waited so long to have the thesis bound. 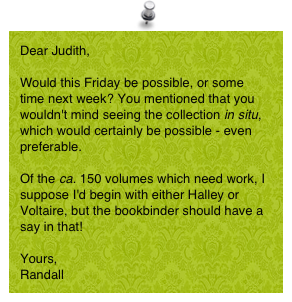 As the saying goes: when the book is ready, the bookbinder will appear. It has been a tremendous journey of the mind, in more ways than just intellectual, that I took with this work, and now that I am finally at peace with it and with all its associations, I am glad that it will be rightfully incarnated as an artifact. And safe in your hands. great work on yr site - amazing what you did with that Puck annual. Thanks Judith, you did an absolutely professional job on my thesis. But you already know that because you've mastered the binding process! Thank you again for doing such a beautiful job on my score. I plan to use your services because I have seen your binding for the theses of my colleagues. Can you advise me on the type of paper I should use. I have a thesis from Beverley Cathy Craven that is really nice. Would you know what type of paper was used? I have a question that I am sure is a long shot. You bound my doctoral dissertation in spring/summer 2007, "Informed consent and genetic databases: an exploration of the authorization model." My hard drive has since corrupted and I cannot seem to locate a final electronic copy of my dissertation. Is there ANY chance you might have this on file? Unfortunately, I didn’t have a copy to give him! My aunt told me she got in touch with you and will send you the cheque. I'm glad she has been able to work it out with you. 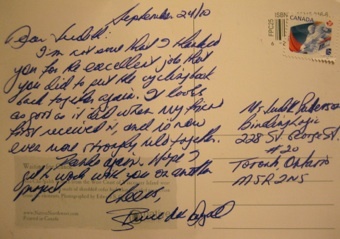 I have been surprised that your business has not been swamped with work from UofT. Especially since you offer such excellent services. I wonder if you business has dropped off in the last year because UofT no longer advertises 3rd party thesis binding companies on their website. I recall that your name used to be on Grad Student's website when I was doing my Masters degree. However, when I finished up my PhD, I couldn't find your name anywhere on the website. I think the University is trying to direct business to the UTP Printing Shop to do the binding. Anyways, I'll tell my supervisor and others to direct work your way since it is well worth it. Sorry I did not communicate that last evening. I saw my supervisor last evening and she loves the colour. Do you have enough for two more of the lilac? r how about the dusty rose? I'll have to make three more sets. I need to collect the receipt so I can get the $100 back from OISE and use that as part of my payment for the next three. I'll be ordering two (lilac) or if not enough, one lilac and one dusty rose. The bindings are spectacular! Thank You. I need two more copies. What times are convenient for you? 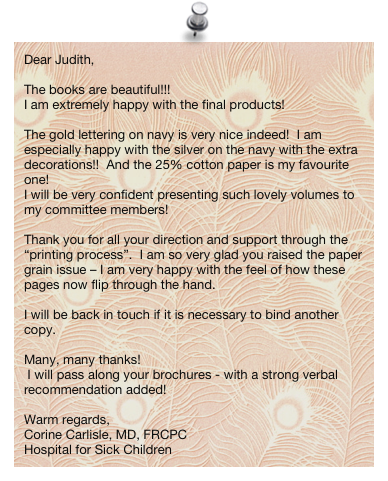 Thanks so much for your wonderful work; my parents are so pleased with the finished volumes. And I am too. I am glad that I waited to get them bound by you, and it has been a pleasure to meet you. I told my friend about you and hopefully she will bring in her dictionary to you one of these days. As well, I will certainly be referring others to you. Have a great week, and please get in touch if there is anything I can do for you. The courier brought it over a little while ago and when my boss stepped away from the office we had a look at the volumes. They are beautiful! My boss’s wife Dr. Amira Klip loved the [marbled] paper we chose and it really looks super. Thank you again for your beautiful work. It was wonderful to meet you in person on Friday. I had heard "good things" and had seen your work in the theses of Margie, Ariella, Beth . . . I had also heard that you are quite open to and understand arts-based approaches as forms of inquiry. I know that not only is this all true, but there is so much more: You ARE an artist! Thank you for seeing through my apples. It's so encouraging for me to know that my work speaks in its own way . . . even when the actual text has not yet been read. I especially appreciate how your honour not only my presence in the thesis but also the presence of my six co-participants, and the presence-to-be of the reader. I will definitely include an end-pocket with samples of the six fabrics to be touches, seen and handled! I've been thinking a lot about the other possibilities our conversation has opened up for me. In my own handmade paper, I will omit the flower fragments. I'm concerned that the acidity over time will affect the paper too much. Also, I very much like the burlap imprinted French (?) paper . . . and its coral hue. Autumnal. And perfect with the coloration of the first Magritte apple image I used !!! Setting a tone at the beginning, and leaving a lingering presence at the end. I would like to ask you to "reserve" some of that paper for me, if you can. I will likely need 9-10 bound copies in total. Thanks so much again: You said that you were tired and that you didn't feel particularly creative. Well, you've given me LOTS already! I'll stay in touch. PS - If you have a few moments, could you please tell me (again) the name of the French papermaking house where the "burlap paper" originated and approximately when??? Those "provenance details" are important to me, and I would love to read up on them a little if I can! They all add additional layers to my work . . . I am wondering if you are the same Judith Patterson who gave a book-binding workshop at the Women's Art Resource Centre in Toronto, probably in 1993? 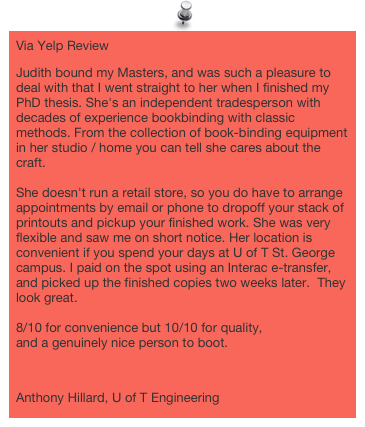 If you are not the Judith Patterson who I met, it is quite the coincidence that you are a bookbinding specialist in Toronto. I am sure you won't mind getting this email by mistake. I found a great thesis binder in Toronto ... I forwarded her PDF flyer to the GSA. I thought it'd be good information to have on-hand as she's very familiar and has a great deal of experience with European thesis standards (along with North American). Perhaps this might be useful to other International students from the same city as myself? I received the thesis last Friday. It looks excellent, I love the colours and the gold ribbon. Thank you so much you did a great job! 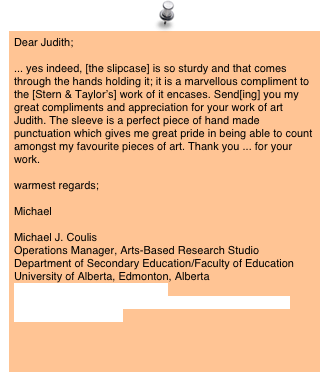 Thank you for your prompt reply Judith! I have to tell you, I asked because I learned the hard way. When I had to submit my thesis to ProQuest, I decided to order a copy just because I was tired…and excited. Then….I got the copy. I was so thoroughly insulted and disappointed. I wrote them letting them know that as well. The quality was so awful. The images were streaky and faded – which is a huge problem considering my study was on neuroimaging (MRI) and stroke recovery. I told them it was an utter insult having worked so many years on this dissertation, only to receive the first copy with such poor quality. Ok, I will stop complaining now. Thank you for your information. I will definitely contact Ismail. It was a wonderful experience to not only share my thesis with my grandmother but with my entire family. The whole family went to the hospital to visit her and I was able to show it to everyone. My grandma was very excited to see it and hold the completed book. My grandma has been cheering me on to finish it since I started. It was an awesome feeling to finish and have a chance to show the final copy to her. Thank you for the beautiful binding. The final product is even better then I had hoped for.